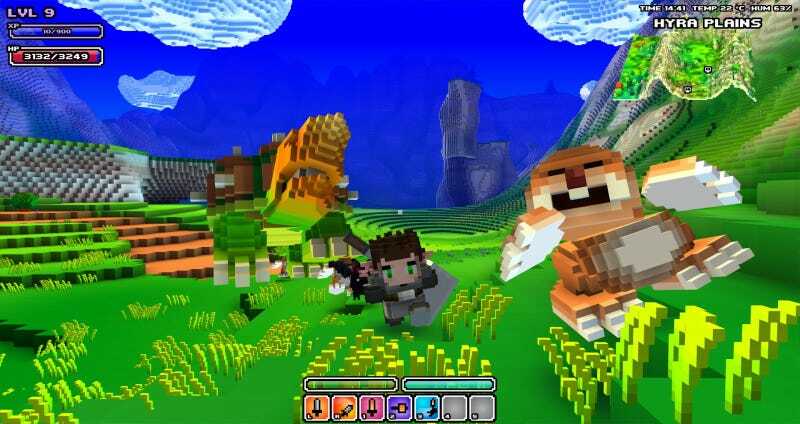 Cube World grabbed endless headlines for good reason: it looked incredible. A playable alpha was released in July 2013, but the game only received a few updates before things got weird. The last time the developers said anything publicly was over a year ago. Is it dead? Apparently not. It once cost $20 to jump into Cube World, but the game stopped being sold a long time ago. It’s understandable people feel burned, especially since the developers have seemingly dropped off the face of the planet. If development has stopped, at least tell people, so they can move on. One of Kotaku’s readers investigated Cube World’s disappearance in October 2013, and the developers told Patricia that, despite the silence, things were cool. But October 2013 was a long time ago. The last time we heard about Cube World was June 2014, when a YouTube video teased the addition of quests, which would have gone a long way towards giving the game some structure. Even now, there are people begging for more information. The Picroma development team for Cube World is incredibly small: Wolfram von Funck and his wife, Sarah von Funck. There have been no updates on Cube World’s website or Facebook account. Neither developer has said anything on social media in months. Wolfram? June 2014. Sarah? December 2013. The last tweet from Wolfram was heavily retweeted and favorited, showing enthusiasm for the game. Then, nothing. When a reader pointed this out to me, it caught my eye. So when I decided to email Wolfram and Sarah, I didn’t expect a reply. To my surprise, though, one came quickly. It’s common for development to take longer than expected, but would it be too much to let people know “hey, we’re still here”? Wolfram claimed he didn’t want to mislead anyone. I’d say fans of Cube World might disagree with him there. Wolfram didn’t have a timeline for the quests update, but said they’d be “a big step towards the full game,” and there’d be more to share soon. “Currently I’m quite happy how it’s coming along and I hope to post more updates about the quests and other new features as soon as possible,” he said. Our collective interpretation of “time” and “soon” may be different than Wolfram’s, however. As for why Cube World can’t be purchased right now, Wolfram pointed towards a change in EU tax law that makes it makes it very complicated to sell games online if it’s not through Steam. There are no plans to release Cube World through Steam until the game is out of beta, but fans should be able to purchase the game again when the quests update goes live. Here’s hoping that happens sooner, rather than later.